You may know what, you may know how, it’s time to know why. He Spends She Spends is about money that doesn’t talk too much about actual dollars and cents. You may know what the Bible says about money and you may understand how to handle your money in a biblically practical fashion, but many Christian families still face financial moments and troubles that are barriers between them and God’s plans for their lives. Why? 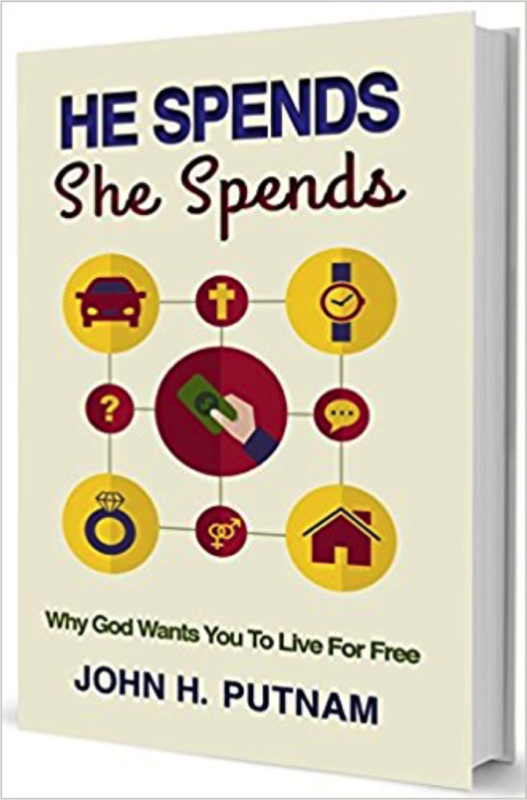 I have found there are more hidden influences around our financial choices than we have ever imagined – that’s what He Spends She Spends brings to the light. This book is a why to book, not a how to book. As a former financial advisor, John has witnessed more financial mistakes and victories than most people will ever experience, and had a few himself! John shares what he has learned through his own maturing walk with Christ, his personal financial journey with his wife Anne, and what he has observed from working with families and individuals like you for over twenty years. As you turn each page, you will discover and explore the plans that God has for you and your money and identify the sources, traps and barriers that we each battle in our financial lives. Then, through biblical wisdom and practical steps, you will begin to aim your hearts, your lives, and your resources toward God, to give you the best chance to live on earth as it is in heaven. Thanks for reading! Chapter 1- "It’s Not About the Money"
Note- Studies show that finances are the number one reason that people divorce. It is imperative that we allow God to be first in all matters, but especially when it comes to dealing with our finances. It is easy to feel overwhelmed when you are dealing with debt, but we need to trust God for the sake of our wellbeing, as well as our relationships. Note- God is clear when he speaks about our money and our heart. “For where your treasure is, there your heart will be also.” -Matthew 6:21. We need to be certain that we are evaluating what we are spending our money on so that we have a good understanding of what we are valuing. Note- It is easy to lose sight of what is important. It happens so fast and before we realize it we have completely negated what God had intended for us. The last will be first, and the first will be last. We have to be showing others the love of Christ, and that means putting others in front of ourselves. Note- The enemy seeks to destroy. God seeks to repair. It’s as simple as that, and we need to be prepared for when the enemy attacks. The closer we are to God, the harder it will be for the devil to get inside of our thoughts. It is crucial to stay close to God. Note- From the beginning God wanted us to be free by giving us freewill. The Lord never intended for us to be slaves to anything. Not Him, not the world, not money. Being free is joyous, and that is exactly what God had planned for us from the start. By being slaves to debt we are violating God’s plan for us. Note- Money is not inherently bad, nor is the stuff we have. It is why we buy what we buy or do what we do that becomes the solution or the issue. If we are being good stewards for the Lord, then money isn’t an issue. However, if we choose to use money and stuff to make us happy we are missing out what God planned, and we are pushing ourselves further away from the Lord. We must be careful not to fool ourselves. Going to church alone is not enough to keep us in close relationship with God. Our day to day decisions make an immense difference to God, and the state of our heart. Note- The devil is always trying to convince us we do not have enough. He is sneaky and deceitful, but we are to overcome this by keeping ourselves close to the Lord, and being prepared for his attacks. Note- The great thing about God is that we do not have to be in charge of our lives. All we need to do is surrender ourselves to the Lord, and by doing that we take control of our lives. He will make our paths straight. Note- Material possessions will always cause issues if we put them ahead of our relationship with God. The Lord needs to be our number one in every aspect of our lives. Chapter 6- "Getting What You Asked For"
Note- Many times we tune out God as we are too busy managing our little “k” kingdoms and maintaining the barriers we have built. We bank on the future, when in reality we aren’t even promised tomorrow. Note- We spend our time acquiring things that society says we need to make life better, yet it complicates life instead. We need to shift our thinking to consider God’s perspective as that is the only thing that will make us truly content in all things. Chapter 7- "We’re Not Alone"
Note- Many feel alone and trapped and don’t want to talk about it. But in reality, every single person has a financial struggle. These things need to be talked about together, the way God planned. Note- No matter what your struggle is God has provided 7 great resources to help you: prayer, God’s word, your spouse, close friend, Godly counsel, your pastor, and God’s church. Note- We think that our path of collecting and buying will lead to more, but it really just creates barriers between us and God. Only God’s path of working hard, generosity, and release will lead to true abundance. Note- God provides all we need, whether we are living in scarcity or abundance. As long as you allow the world to gauge how much is enough you will never be content, but under God’s plan it will be more than enough. Note- We are exactly where we are supposed to be and God has amazing plans for us. But we must also reflect, plan, and pray about our journey ahead to find clarity, unity, and context. Note- Think progress, not perfection. The devil will try to make you think that you are off course, but when you focus and trust in God you can never be led down the wrong path because God has a plan for you no matter the path. Chapter 10- "Starting Together Again"
Note- Remind yourself that you are not just working on your finances but you are getting your life back. You’re turning from what will rust, break, or get stolen and turning towards what will last forever. Note- You cannot love both God and money. You must choose which one you will be a slave to. When we choose God and His plan, money ceases to be a distraction, as whatever amount we have will be enough. Note- When you pack light, you have the freedom to follow wherever God called you.